With the restrictions on freedom of movement being lifted for Romania and Bulgaria at the start of the new year, immigration has climbed back up the news agenda this week. 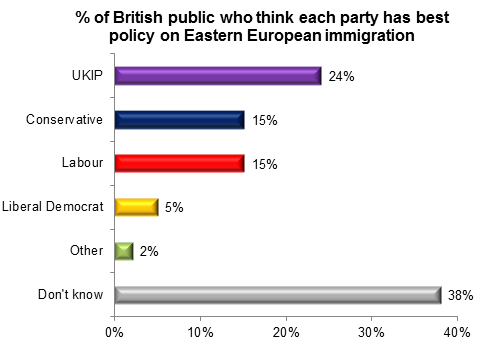 But while David Cameron feels heat from The Sun, ComRes polling shows that it is UKIP who the public think has the best policy on Eastern European immigration. Moreover it appears that for all Mr Cameron’s rhetoric on the issue, it has brought him no electoral advantage over Labour. Nevertheless, Mr Cameron’s pronouncements are playing very much to public opinion. Very large majorities say that they are concerned about immigrants from Eastern Europe being eligible to receive benefits as soon as they arrive in Britain (82%) and putting pressure on public services (82%). 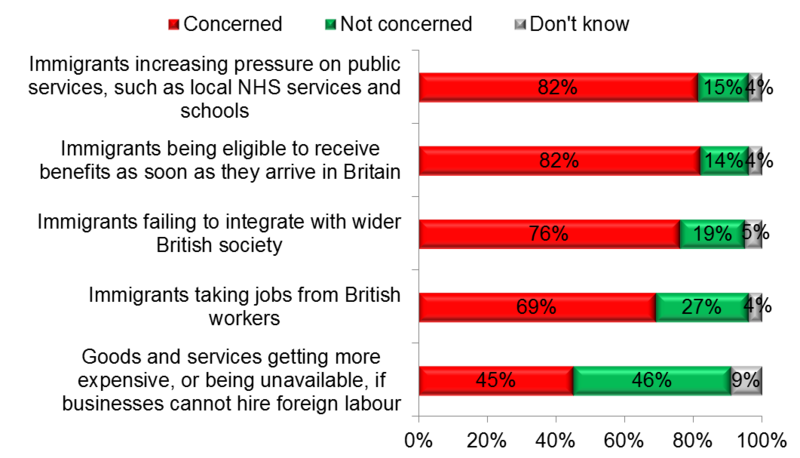 People are comparatively less worried about immigrants taking jobs from British workers (69%). Mr Cameron’s attempts to place restrictions on what benefits new immigrants can receive upon arriving in the country therefore ought to chime better with the public than Gordon Brown’s pledge of “British jobs for British workers”. Whether it translates into credit for him is another matter. But beyond being an idea that many people oppose, what do the public actually think about immigration? Firstly, they think of immigration in quite particular terms. In a recent ComRes poll for ITV News, we began by asking the public about a range of words and phrases which they might associate with immigration from Europe. 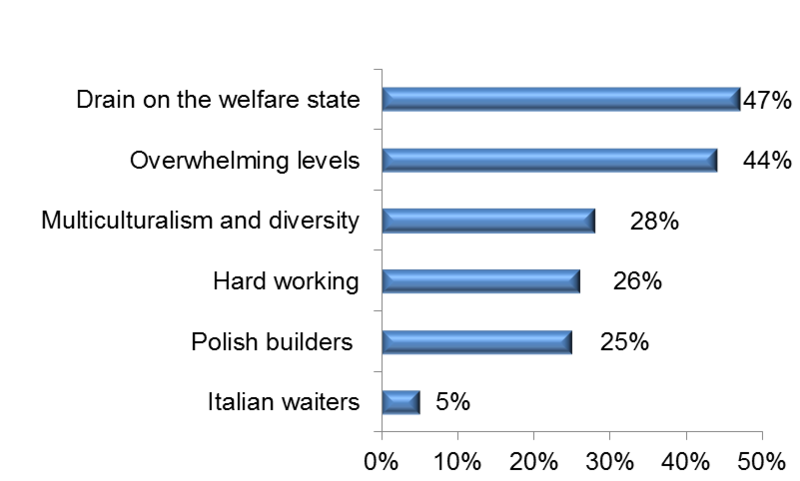 Five times as many people associated immigration from Europe with “Polish builders” (25%) as with “Italian waiters” (5%). But some people appear to hold seemingly contradictory views about immigration. Among those who associate immigrants with being “hard working”, two-thirds say they are concerned about immigrants from Eastern Europe receiving benefits immediately (67%) and putting pressure on public services (66%). The same applies to those who associate immigration with ‘multiculturalism and diversity’: seven in ten (70%) are concerned about immigrants ‘failing to integrate with wider British society’. 46% of Britons say that they think Eastern European immigrants receive more in benefits and public services than they contribute in taxes. Although they may or may not be right, it is still only around half the proportion who say they are concerned about immigrants receiving benefits or putting pressure on public services (82%). Of course, these may not actually be contradictory. It is quite possible to think immigrants are hard-working but believe the principle of them receiving benefits as soon as they arrive in the country is wrong. Or that they pay their tax, but the British state would not be able to build enough schools or hospitals quickly enough to deal with growing numbers of users. Most significant for Mr Cameron however is the lack of advantage for his Party over Labour on the issue. In 2011 Migrationwatch published a report calculating that more than three million migrants joined the UK population during “Labour’s open door on immigration”. The issue consistently lies in second place under the economy as the biggest issue for voters. That is why both Labour and the Conservatives will be praying that the Democracy Institute, a think tank, is wrong in estimating that some 385,000 Bulgarians and Romanians will come to Britain after restrictions are lifted two weeks from tomorrow.